My poor husband has been requesting strawberry rhubarb pie for a couple of weeks now. I set out this past weekend to make him one, however once again he ended up out of luck. I couldn't find rhubarb anywhere! Not even at the grocery store....what's up with that??? So I had to go with plan B, which was blueberry cheesecake bars. I came across this recipe a few weeks ago and I haven't been able to stop thinking about making them. I have been wanting to attempt cheesecake again (since all my previous attempts over the years have all failed) so I figured this would be a good place to start. I also have an over abundance of blueberries (as a result, this won't be the last recipe you'll see this week from me featuring blueberries), so this seemed like the perfect dessert for the weekend. Boy, am I glad I couldn't find rhubarb! These bars were divine - we all loved them!!! Super easy recipe, and a "cheesecake success" for me....YIPPEE! I will have to try it using a different fruit next time, like maybe strawberries. So excited to add this to my ever growing list of favorite recipes! Heat oven to 325°F then lightly spray an 8- or 9-inch square pan with non-stick cooking spray. Place graham crackers into the bowl of a food processor with 2 tablespoons of granulated sugar, then cover and process until fine crumbs form. Add the melted butter then cover and process until the cracker crumbs are evenly moistened. Press graham cracker crumb mixture evenly into the bottom of the pan and bake 10 minutes until lightly toasted. Cool 10-15 minutes. To make the cheesecake bar filling, add the cream cheese, eggs, 1 tablespoon lemon zest, the lemon juice and 1/2 cup of granulated sugar. Cover and process until smooth and creamy. 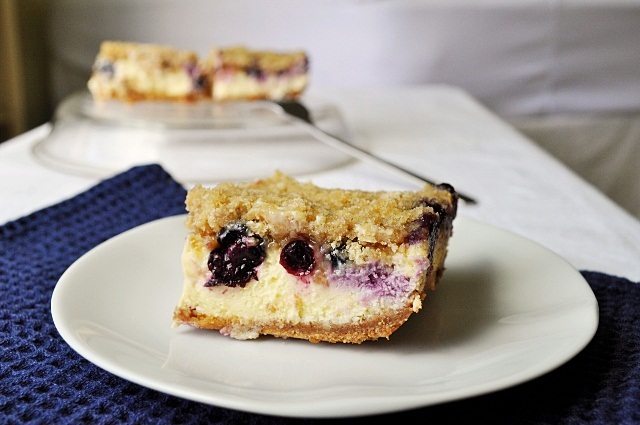 Pour cheesecake filling over crust, and then top with blueberries. Make the streusel topping by adding brown sugar, flour and cold butter to a medium bowl and use a fork or your fingers to cut in the butter until mixture becomes crumbly, and then sprinkle over filling. Bake for about 45 minutes or until topping is lightly browned and center is almost set (center will jiggle slightly when moved). Cool 1 hour at room temperature, then refrigerate for at least one hour before serving.